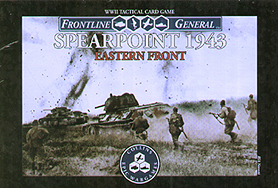 Spearpoint 1943 Eastern Front is a fast two-player tactical card wargame. 110 Soviet and German Unit cards feature historical squad level infantry, artillery, armour, and aircraft fighting through 12 historical battles or standard points-based games. 55 Command cards give players tactical options. 25 Damage cards apply unique effects to damaged combatants. Quick Reference cards, Event cards, Scenarios cards, Unit List cards and more are also included. Combat is tense and resolves using four included d10s. Every game plays in 30 minutes.